The Abilities section shows you abilities you have assigned to slots (number keys 1-5). This section also shows you when you have an ability on cooldown and how much time left until you can use it again. The party section shows immediate information regarding the party's status. 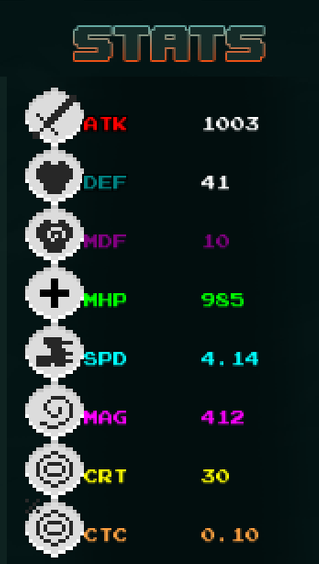 The Green bar at the top of each slot represents the HP (hit points) the character has remaining. The bar under this is the energy bar. This bar represents the amount of energy (mana, aura, etc.) the character has to be able to use abilities. 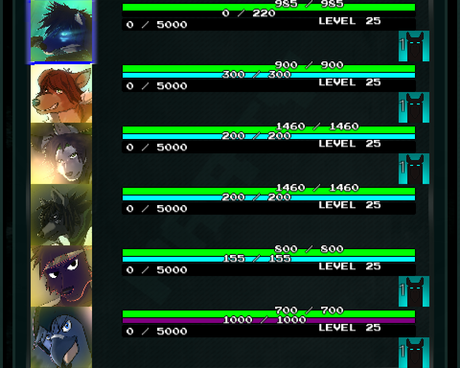 The third bar shows the experience the party member has, as well as how much experience is required to reach their next level and their current level. Under these bars is space for status effects such as poison, attack up, attack down, etc. These icons also display how much time the status has left until it is removed. The coloured box around a party member portrait shows which character is currently focused/ selected. There are more boxes of varying colours to show what character a friend is playing if they are playing co-op with a controller with you. The paradigm section is used to give party members roles in combat. The three roles are: Follow, Attack and Defend, respective to the shown image. You can set all party members to Follow by pressing Y. You can set all party members to Attack by pressing U. And you can set all party members to Defend by pressing I. Otherwise you can click on each icon individually to give individual characters roles. The inventory section contains all of the party's items. As soon as an item is touched by an ally it is put in the inventory box. The inventory box can contain up to 64 different items but it can also stack items that are the same. The number over each item displays how many items are in the stack. Hovering over an item with your cursor shows details about the item/ what it does. 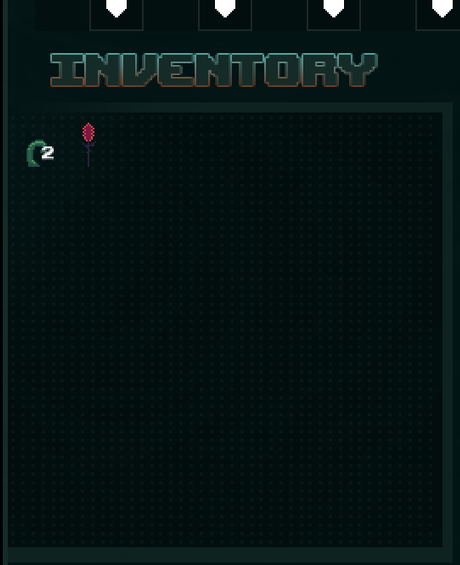 You can pick up an item from the inventory box by Right Clicking it. once you're holding the item Right Click again over the portrait of the character you wish to use it in the party section of the HUD. You can destroy the item by holding Right Click over the game world view. Items fall into varying categories including: use, materials, currency and vital. Use items can be used by characters, such as potions. Materials are ingredients to be used in recipes to craft something usable. Currency is much like a material, they are used with traders to buy items. Vital is an item that cannot be destroyed or used as it is required to fulfil a quest. In Arlanora there are no equipment slots so you can often find items such as armour or weapons that will boost your stats permanently without taking up an equipment slot (as they don't exist). The stats section gives you numerical information regarding the selected character's attributes. MHP: The character's maximum hit/ health points. This button will bring you to the ability tree screen for the selected character where you can use talent points earned through levelling up to unlock new abilities and increase the character's stats. This button brings you to the Quest screen where you can see the progress of all the quests you are currently on as well as quests you have already completed. This button brings you to the Map screen where you can fast travel to locations you have visited before. This button brings you to the default paradigm screen where you can set which roles your party will take as soon as they enter a new area.